Popes and saints have opposed attacks of the Talmudic Jews on the Catholic Church. Today the evil seems unopposed. The Talmud which blasphemes Jesus and Our Lady is being translated into Italian by the Italian Ministry of education. Rabbi Ricardo Segni, the chief leftist Rabbi in Rome, is on the committee overseeing the translation. 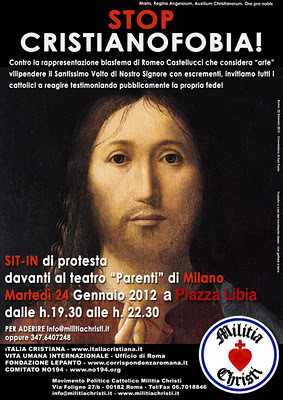 From January 24 to 28 at the theatre Parenti in Milan a blasphemous opera was held. It had the support of the Jewish Left media. The opera Sul concetto di volto nel figlio di Dio, Romeo Castellucci does not come under hate laws created by the Jewish Left, the ADL etc. The staging of this opera in Milan known for its blasphemous scenes when staged abroad, is part of the religion of the Talmudic Jews. The director of the Parenti theatre it is reported, is a Jew, Ruth Shammah. Blasphemy is part of the beliefs of members of the Bnai Brit, Italy who have threatened Catholic academics and universities with criminal charges, for only affirming Catholic teaching. They object to the Catholic teaching which says Judaism and other religions are not paths to go to Heaven and that Jews need to convert into the Catholic Church to avoid Hell; for salvation. (Dominus Iesus 20, CDF, Notification on Fr. Jacques Dupuis S.j etc). The Rabbis visited the Urbaniana Pontifical University in Rome. The Jewish Left values and the opera in Milan represent Satan and were not criticized by the Jewish Left. The opera in Milan against the belief in God with its accompanying blasphemy, in the arts and media, is a part of Talmudic Judaism, the religion of the Freemasons and the Jewish Left. It is the religion of those who choose to serve Satan instead of God. Those who oppose the Talmudic Jews, the Satanists, Freemasons and the Kabbalists are threatened with anti Semite laws. It is anti Semitic to be a Catholic. Jesus called a type of Jews, children of the devil and ‘snakes and vipers’. He spoke about the ‘synagogue of Satan’. The owner of the adult film industry in the USA is a Jew and also blasphemes against Jesus it is reported on the internet. Recently there was a Catholic Jewish Left Day of Reflection in Rome. Maintaining dialogue and ‘having good relations with the Jews’ means not being victimized by the political and military threat of Israel and the Jewish Left. In exchange, the Catholic Church has to change its teaching in ecumenism (no ecumenism of return) and Judaism and other religions (they do not have to convert and all religions are equal). Restrictions are placed on the Catholic Traditional Latin Mass which is vehemently opposed in the leftist mainstream media in Italy. The price of ‘good relations’ is the creating of a culture with blasphemy, atheism and hate enforced with legal blackmail and extortion, against the followers of Jesus Christ, whom Satan hates. The Antisemitism threat is being used against Catholic bishops to make them announce that those who are faithful to Jesus and His Church are not Catholics. Catholics are being asked by the Jewish Left not to use the word ‘Catholic’. Satan is a liar and his actions are covert. Those Catholics who rebel could be ruined financially. So Catholics do not want to talk about this issue in public. They just mention the ‘liberals’ and not the Jewish Left threat to ‘liberal Catholics’ to remain liberal. I was studying at a Pontifical University and seminary in Rome but could not continue my studies since they have to protect themselves from Jewish Left laws. The faculty was being opposed by ‘outsiders’ because of my official Catholic views. My Spiritual Director was being telephoned and finally he asked me to search for a new Spiritual Director. This priest himself would have to leave the seminary. Pontifical universities in Rome welcome students with liberal views, freethinkers and New Agers, those opposed to Church teachings. Those who hold the Catholic teachings are threatened and expelled. This is done often with the approval of the Vatican including the former Congregation for the Doctrine of the Faith. The cardinals and bishops want to maintain ‘good relations’ with the Jewish Left and their Catholic supporters like Andrea Riccardi and the St. Egidio organization. Forza Nuova, Militi Christi and others are protesting against the opera in Milan. New Obama policy galvanizing national opposition to his contraceptive mandate. The new Obamacare contraceptive mandate is serving to effectively unify various factions within the American Catholic Church in a way we haven’t seen in quite a while. The bishops are stepping up and the laity is backing them, virtually one hundred percent. We have Barack Obama, the Abortion President, and his chief hatchet woman, Kathleen Sebelius, to thank for this very promising turn of events! We cannot—we will not—comply with this unjust law. People of faith cannot be made second class citizens. We are already joined by our brothers and sisters of all faiths and many others of good will in this important effort to regain our religious freedom. Our parents and grandparents did not come to these shores to help build America’s cities and towns, its infrastructure and institutions, its enterprise and culture, only to have their posterity stripped of their God given rights. In generations past, the Church has always been able to count on the faithful to stand up and protect her sacred rights and duties. I hope and trust she can count on this generation of Catholics to do the same. Our children and grandchildren deserve nothing less. And therefore, I would ask of you two things. First, as a community of faith we must commit ourselves to prayer and fasting that wisdom and justice may prevail, and religious liberty may be restored. Without God, we can do nothing; with God, nothing is impossible. Second, I would also recommend visiting www.usccb.org/conscience, to learn more about this severe assault on religious liberty, and how to contact Congress in support of legislation that would reverse the Obama Administration’s decision. If a similar letter hasn’t yet been read at your parish, there’s no need to wait. The time to get behind our Catholic bishops is now. You know the issue. You know the right thing to do. We can’t let these corrupt, tin horn politicians trample on our constitutional rights! Former Planned Parenthood employee explains how abortion pills are dispensed over the internet. Each patient is first examined by a staff member at the remote clinic, then interviewed for a few minutes by a big-city doctor using a video link. Once the doctor determines that the medication would be appropriate, he or she pushes a computer button that opens a drawer in front of the patient. The patient withdraws the pills from the drawer and takes the first dose while the doctor watches. The patient then takes the rest of the pills at home, where she aborts her pregnancy. Editor’s note: Killing babies in the womb is not nearly as simple as it might appear. While the abortion pill is typically always fatal for the baby, various complications may also threaten the life of the mother. The estimable Theodore Dalrymple has also referred to Islam as the Marxism of our times, though he feels its totalitarian tendencies are borne of an inherent weakness: its inability to withstand philosophical scrutiny. Bad fruits of Iraq war: Catholic population of Iraq fell from over 800,000, to less than 150,000 now. Archbishop Broglio believes Catholicism suffered after the invasion because of a perceived closeness to its previous ruler. He said Saddam Hussein tended “to trust Catholics, and gave them positions of responsibility.” One prominent Iraqi Catholic was Hussein’s Foreign Minister Tarik Aziz. And even if Catholics “weren’t particularly part of the regime, they became identified with the regime,” Archbishop Broglio said. Speak Out Illinois hosts reformed Planned Parenthood employee, Abby Johnson. The event, organized around the theme “Reclaim America for Life,” brought together members of more than 35 anti-abortion groups to work toward renewing and continuing efforts to end abortions. Johnson left her job as an abortion counselor after watching an ultrasound-assisted abortion in 2009 and seeing “that baby recoil and then try to flee from that abortion instrument,” she said. We cannot—we will not—comply with this unjust law. People of faith cannot be made second-class citizens. We are already joined by our brothers and sisters of all faiths and many others of good will in this important effort to regain our religious freedom. Our parents and grandparents did not come to these shores to help build America’s cities and towns, its infrastructure and institutions, its enterprise and culture, only to have their posterity stripped of their God given rights. In generations past, the Church has always been able to count on the faithful to stand up and protect her sacred rights and duties. I hope and trust she can count on this generation of Catholics to do the same. Our children and grandchildren deserve nothing less. Editor’s note: Let’s give the bishops some time to develop their officially strategy on this very important matter. Then, it will be imperative for every one of this nation’s 10 to 20 million practicing Catholics to fully support the bishops, to the very end. As for all the rest … who knows?